Bengalis are well-known for their fondness of fishes, as well as, for sweets. Supported by mother river Ganges, along with other different sized water bodies and even with a little coastal area, fish of different varieties, is a round-the-year availability. 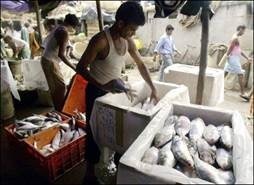 In Bengal, the fish market is mainly divided into two major areas – the basic vegetable greens and the ‘Mach Bajar’ (Fish Market); where sellers of meat and poultry are simply ruled out! 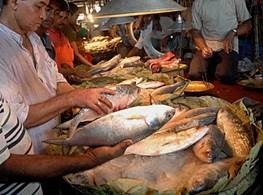 The huge demand of fish among Bengalis has, thus, created the ‘Mach Patti’ (the whole sale market exclusively for fish). And no wonder a large number of fish comes here from other parts of the country also, namely, Odissa, Hyderabad, Chennai and even from the neighboring country, Bangladesh. Bangladesh??? Yes. Bangladesh! And when it comes to Bangladesh, the fish should be no doubt ‘Hilsa’, or, ‘Ilish’. Bengali fish-lovers consider hilsa as the ‘King of Fish’. Hilsa is mainly a marine fish, but, unlike others, it spends its major life-time in sweet water and bay area. The normal grown/ adult fishes are 20 – 22 inches long and about 3 kgs in weight. It has scales with a notch of gold, which gives it a majestic silver appearance. Hilsa is an oily flat fish and has more or less very sharp and tough bones, throughout its body. Due to this reason, most of the people find it difficult to enjoy this delicacy. Here lies the typical role of the ‘Chef’. Preparing boneless hilsa is considered a culinary art and mastering it requires quite credibility. Thus, the Chef takes this delicacy to a step ahead to delectable. Preparing hilsa in different styles is a century-old tradition. Bangladeshis (though in other sense, Bengalis, but citizens of Bangladesh), can cook hilsa in numerous ways. Starting from simple frying to smoking, some of the popular and authentic dishes are – Ilish Begun, BhapaIlish, Doi Ilish, Ilish Tok-Jhal, Shorshe-bata Ilish, Narkel-bata Ilish, Ilisher Dom Chochchori, Ilish Paturi, Ilish Macher jhol, Nona Ilish MacherJhol, Panta Ilish. It also goes seamlessly with ‘PuiShak’, ‘KachuShak’, ‘Spinach’ etc. The present-day’s preparations like Smoked Hilsa, Grilled Hilsa, Boneless Baked Hilsa, Ilish Biriyani, Aam Ilish – all claim to be as delectable and mouth-watering as the centuries-old preparations. 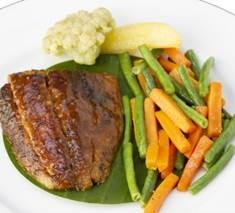 Gourmet Chefs have made their ways of preparing hilsa in competition with other cuisines such as – Ilish Salsa, Malabar Ilish, Hilsa in French Mustard Sauce, Shorshe Ilish grilled with Romesco Sauce, Ilish Pitha, Ilish Pulao, Hilsa in Coconut Milk. While cooking hilsa, one must consider the fat content of the fish. A higher fat content often results in excessive fat left in the pan after frying. It is a saying among the Bengalis that, a good hilsa does not require any oil/fat to fry. It fries itself in its own oil/fat. Moreover, the left-over fats in the fry pan are also cherished with hot rice and green chili! Hilsa fat consists of a unique flavor, unlikely without a sticky/fishy smell. 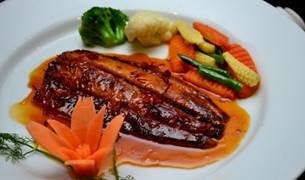 But one should keep in mind that the fat content of this fish is not only in its liver or skin, but, it has layered fat between its bodies. It is technically termed as marbled fat. Besides its unique flavor, this fat gives the fish its softness and it almost melts in the mouth. In spite of all its flavor and taste, a large number of people are unable to cherish it. 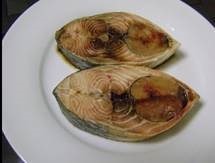 Hilsa contains more than average muscle bones (‘kanta’). Also the central bone and bones in other parts are strong, sharp and doesn’t break easily. Muscle bones are very thin, long, and pliable. These often get stuck in the mouth and due to its pliability, do not come out easily. The scales transform into a sharp angle at the bottom part of the fish, adding to further uneasiness in eating. 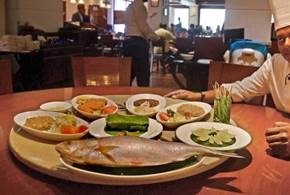 For those who wish to stay away from fish bones, may wish to try some boneless preparations in some of the speciality restaurants of Kolkata and Dhaka. Able/Well-trained chefs prepare various hilsa preparations around the monsoon, after carefully removing all the bones, but, without much affecting the taste or texture. In the season, you will find a handful of speciality and gourmet restaurants in Kolkata and in Dhaka, serving this delicacy for the food-lovers. All of them are doing well, having a good clientele also. But just one problem is grasping the market. It’s the availability of good-sized hilsa, which is decreasing day-by-day. The huge and priced demand of large hilsa resulted in mass fishing. Unfortunately, the time to catch them is the prime time of their reproduction. Catching an adult fish means making their eggs root out. Also, catching young hilsas, popularly known as ‘Shad’, means eliminating adult hilsas. Thus, slowly they are becoming less in number. Scientists have warned that continuation of this trend will surely make them extinct. To avoid such a disaster, immediate halt to the fishing is necessary. For an effective roll-back an effective 5 years of non-fishing is required, which should be repeated frequently. Both the governments of India and Bangladesh can surely impose such ban, but their challenge is how to support the lakhs of fishermen, living below the poverty line, whose hope of earning a considerable amount is the hilsa. To them, a ban on hilsa fishing means a year of unemployment. Fortunately, Bangladesh government has already taken some fruitful steps like providing the fishermen rationing without charges, monetary allowance, community development programmes, health and medical support, primary education support etc. And, slowly the result is reaping. But, there’s still a lot to go! Till then, we can enjoy the taste of hilsa, but, definitely by paying a higher price! has been published in the Where and What in the World today, on 27th July, 2013.